BEACON Researchers at Work: The páramos – understanding a hyperdiverse ecosystem one genus at a time. This week’s BEACON Researchers at Work post is by University of Idaho graduate student Simon Uribe-Convers. I am always amazed by the huge diversity around us. Taking it for granted, it seems humans only remember the world’s diversity when watching a BBC documentary. Nevertheless, the study of biodiversity has been one of the main foci for biologists and naturalists. As humans, we have the tendency to classify objects based on their characteristics and/or functions, and biological entities are treated in a similar way. To date, plant systematists have discovered and classified more than 300,000 species of flowering plants mostly based on morphological characters. With the extensive use of DNA in the last couple of decades we have been able to corroborate and correct many of these classifications. However, conservative estimates of biodiversity suggest that we have only discovered and named ~10% of all the species found on the planet. This is particularly evident when we look at the high numbers of new species described from well-explored areas like North America, as well as important biodiversity hotspots around the world. I have the luxury to work in one of these biodiversity hotspots: the páramo. The páramo ecosystem, found in the high elevation regions of Andean South America, is considered to be the most biodiverse montane ecosystem in the world with ~4,000 species of vascular plants, and nearly 60% (~2400 spp.) of these are endemic. It is thought that the current diversity found in the páramos is the result of different evolutionary processes involving colonization of species from the Amazon basin, the South American savannas, and temperate North America. 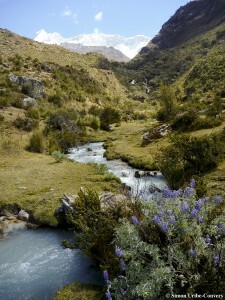 Furthermore, because the páramos are only found above 10,000 ft. along the Andean cordillera and effectively act as islands, ‘sky-islands’, surrounded by lowland valleys that prevent the dispersal of species, it suggests that in situ and/or allopatric speciation may have played a large role in shaping the diversity that we see today. 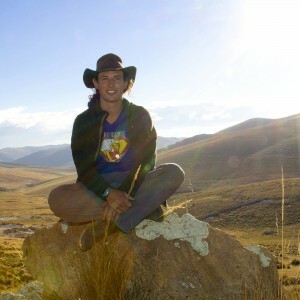 Unfortunately, it is impossible to study biodiversity as a whole in such a rich ecosystem like the páramo, and thus, we study it by choosing groups of species that are representative of the environment. I have chosen the plant group Bartsia L. for my dissertation and I am studying the evolutionary history of this genus and how it came to be what is observed today. Bartsia is a member of Orobanchaceae, the largest parasitic plant family of angiosperms, and is what botanists call a hemiparasite. Hemiparasite plants are those that still produce chlorophyll and that are capable to do photosynthesis. Nevertheless, hemiparasites plants still form connections with their hosts and obtain water and sometimes nutrients from them. In the case of Bartsia and other close relative in Orobanchaceae, they do it by forming root-to-root connections through a structure known as hautorium (plural: hautoria). The genus is comprised by ~50 spp. and as it is currently defined, it has two species in the mountains of northeastern Africa, one in the Mediterranean region, and one north temperate species. The remaining ~45 species are distributed throughout the páramo of Andean South America and are the main focus of my work. The first question I had about Bartsia pertained to its strange and very disjunct distribution. I wanted to find out whether these species are each other’s closest relatives (in phylogenetic terms, whether they are monophyletic). By using molecular techniques and a few chloroplast and nuclear genes, I discovered that they are not monophyletic and that they are actually four distinct evolutionary lineages that correspond to their geographic distributions. The result of this discovery has some taxonomic implications with the most important one being the break up of Bartsia into groups that better reflect their evolutionary, or phylogenetic, relationships. I was also interested to know how and when Bartsia had colonized the páramos. The Andes are a very young mountain range that started uplifting approximately 10 million years ago (MA) in a geologic period known as the Miocene. However, it was not until only about 5 MA that the Andes were high enough to host alpine-like conditions, the ones that Bartsia strives in. I used computer algorithms that make use of genetic data and time calibrations, like the uplift of the Andes or additional molecular dates, to infer that Bartsia colonized the páramos between 1.53 and 4.11 MA. These dates fit well with the time when the alpine conditions, or in other words the páramos, were appearing as a new environment. Now, imagine that a new empty niche is created and that the first groups that get to it have the opportunity to radiate into multiple species. This is what likely happened with the common ancestor of the current South American Bartsia. Actually, if we look at how much the genus is diversifying, something we do by looking at the rate of how many species are being created (speciation) minus the rate of how many are going extinct, we can see that the genus is diversifying twice as fast as its European relatives! Something similar has been shown in other plant groups in the páramos like lupines (Lupinus) and in the valerian family (Valerianaceae). Finally, I am currently working on understanding the relationships between the ~45 spp. in the páramos. Due to their young age and thus similar genetic content, it is hard to gather the necessary phylogenetic information from just a few genes. This is why I have designed PCR primers for the 48 most informative regions in the chloroplast and I am in the process of designing primers for 48 independent nuclear genes. I will amplify all these regions using a new method called microfluidic PCR, which allows me to amplify ~2300 reactions simultaneously that are ready to be sequenced using next-generation sequencing platforms. The data from the 48 chloroplast regions is ready and looks good and I am excited for the nuclear data! With all these I expect to be better able to understand how Bartsia diversified in the páramos and to be able to infer other evolutionary patterns in the group like its biogeography. I also hope that my study has broader implications by aiding in our understanding of how hyperdiverse ecosystems like the páramo have assembled, which is of general interest to biodiversity researchers, as well as policy makers and conservation agencies. By understanding how certain groups evolved, we can make predictions on how other similar groups will react to changes in their habitat due to land use or climate change, which will aid in the creation of more informed policies and conservation strategies. For more information about Simon’s work, you can contact him at uribe dot convers at gmail dot com. This entry was posted in BEACON Researchers at Work and tagged BEACON Researchers at Work, biodiversity, diversification, phylogenetics, plants, rapid evolution. Bookmark the permalink.